Well I had a lovely time at the quilt group sewing day on Saturday. I went armed with my selection of lovely Xmas fabric and my brand new rotary cutter and came away with the pieces for an Xmas wall hanging which I put together yesterday and edged this evening. All that is left to do now if to buy some wadding so that I can layer it and quilt it at the weekend.I adapted a quilt pattern that I have had in my folder for a long time – it was originally meant to be made of 12 blocks but I only wanted a small hanging so just made 4. The pattern is based on two different nine patch quilt blocks with four of the nine patches being split in half. 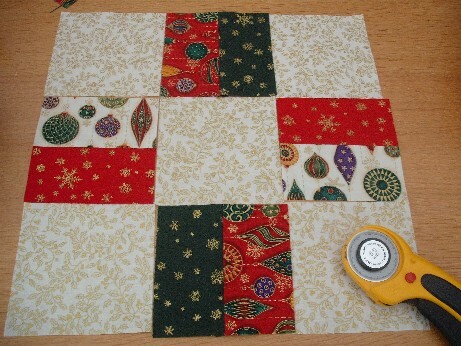 You then join the blocks and applique a tree where the four paler blocks join. 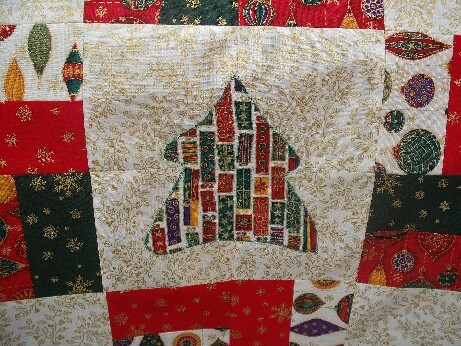 I plan to sew brass Xmas charms in the pale blocks around the tree and to put some beads on the outline of the tree after it is quilted.This hanging will go in my hall on the wall opposite all my little baubles which are made of this fabric. I love the bauble fabric from Makower which has been in my stash for a couple of years – I am hoping to get more of this at the Harrogate show. I really enjoyed the day , everyone was very friendly and helpful , especially Jackie and Davina ,who I sat with, and they taught me how to use the rotary cutter properly and lent me a larger cutting mat and their rulers which made life so much easier. I am going to treat myself to these essentials tools – may wait till the Harrogate Knitting and Stitching Show in Nov and add them to my shopping list for that if I can wait that long! I am amazed at how quickly the piece came together, being so used to hand stitching which takes me weeks sometimes. 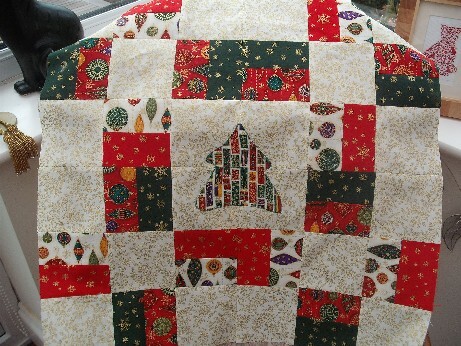 Davina cut out and made an entire quilt top for a child’s bed in one day. I think I will really enjoy this new crafting! I won’t stop hand stitching or knitting as I like to do that in the evenings in front of the TV but now I have got my new machine I will be doing much more with it. I have always been a bit nervous of sewing with a machine – I learnt to use a hand-operated machine so electric ones always seemed too fast and I have not really used them for anything apart from costume making.It has always been a bit of a love hate relationship as I seemed to spend half my time battling to get the thing to work! But the new machine is very lovely and I envisage many happy hours together over this winter! In other exciting news I have won my first ever blog giveaway! I was looking at my blog with a friend earlier today who had come round to look at setting up a blog for our branch of the Embroiderers’ Guild and was showing her how you could see where people come from to get to your blog and noticed a lot of people clicking on my blog from Greedy for Colour , Kate from New Zealand’s fab blog, and then realised it was because I had won the pincushion giveaway that she ran for her recent birthday. I am very thrilled, especially as her work is amazing so thank you very much Kate! Do go and visit her blog and admire the loveliness. Am getting on very well with the little Xmas tree patchwork ornaments for my craft fair – assembled another two tonight after adding the border to my hanging. Will be doing some more of those at the weekend as well as finishing my Xmas hanging and the next Monday we are off to lovely sunny Spain for a week during half term ! Can’t wait – especially as it is absolutely pouring down here at the minute and the weather forecast says we are in for a very cold spell at the end of the week. Hope you have a nice weekend , see you when I return – thank you for visiting. Oh yes I will , been trying to work out how to quilt it once it is backed, think I will just quilt round all squares by machine then do some hand quilting on the tree and add some beads and charms to it. Am not very confident yet with the machine or would try some freehand quilting.